After 10 years: Does the Q6600 Still Have Diversion in 2017? Launched over a decade ago, the 65nm Core 2 Extreme QX6700 was Intel's first quad-core desktop processor. 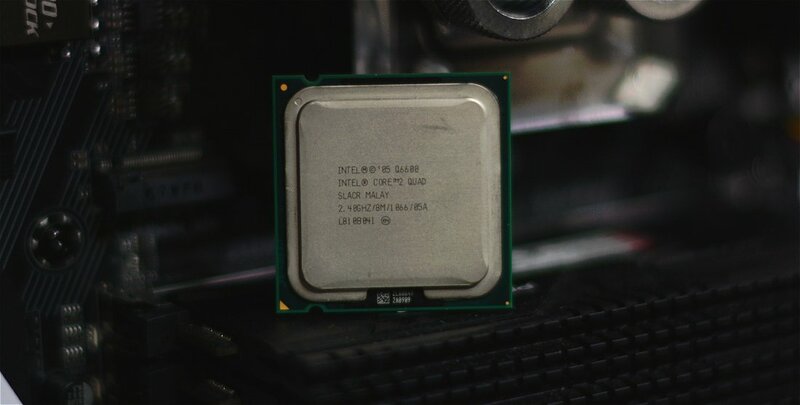 Though its ridiculous asking price of $1,000 ensured few would take the plunge, even with four unlocked cores operating at 2.67GHz, it was the fastest CPU money could buy back in 2006. Fortunately, it was only a few months later when enthusiasts were blessed with the Core 2 Quad Q6600, another Kentsfield-based quad-core chip that sold for a less absurd $530. Although the part was locked at a frequency of 2.4GHz, we were still able to overclock via the front side bus back then, allowing us to boost the Q6600 from its stock 2.4GHz operating frequency to well over 3GHz! By no surprise, it quickly became one of Intel's most popular enthusiast-grade processors of all time. Released about 10 years ago, we thought it would be interesting to see how the Q6600 holds up in 2017 while playing today's games on modern GPUs. In other words, what would happen if you paired a trusty old PC with a GeForce GTX 1060 or GTX 1070. We'll also throw in a Haswell dual-core Pentium, a Skylake Core i3, a Sandy Bridge Core i5 and the mighty Core i7-6700K. All CPUs will be benchmarked using the two Pascal graphics processors to establish some comparisons. Quite a load is going to be placed on these aging processors as we test some of the most CPU-intensive games released in the last year to see if the Q6600 can cope with such a burden. 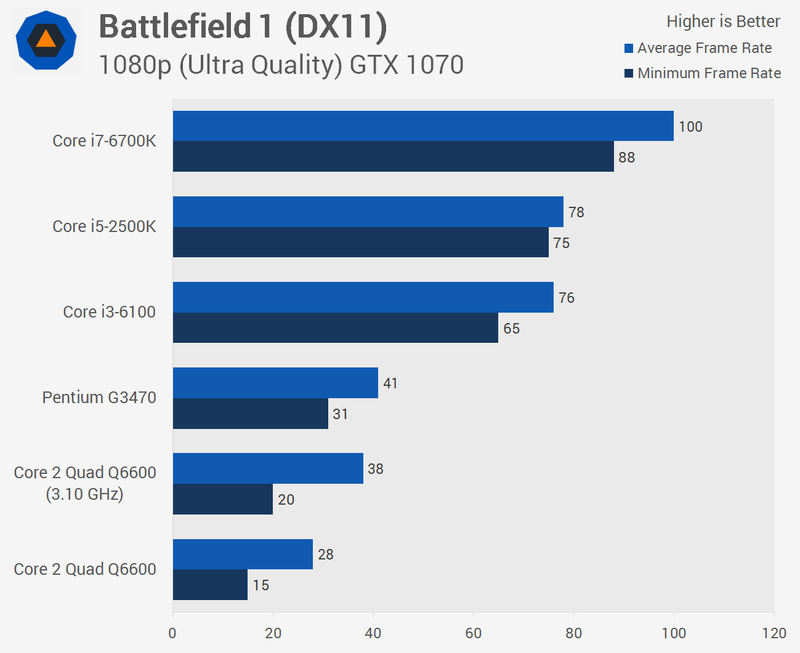 The Core 2 Quad Q6600 really struggled in Battlefield 1, delivering just 26fps on average at 1080p with the GeForce GTX 1060 handling the rendering. 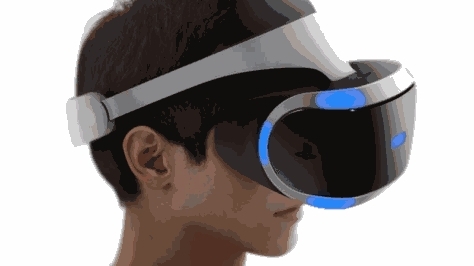 Worse still, stuttering was a massive issue and we often saw the average frame rate cut in half as the system halted. Even overclocking the Q6600 to 3.1GHz didn't get it out of trouble as minimum frame rates still dipped into the teens. Intel's fourth-generation budget Pentium processor did a better job, though it wasn't exactly smooth either. However, the now six-year-old Core i5-2500K kept its cool, delivering slightly better performance than the Skylake Core i3-6100 processor. With an average of 69fps and a minimum of 58fps we were quite impressed with the 2500K and when paired with the mid-range GTX 1060, it wasn't a great deal slower than the 6700K. Jumping up to the GeForce GTX 1070 allowed the 6700K to distance itself from the 2500K. That said, the 2500K was now noticeably better than Core i3-6100 when comparing the minimum frame rates. Again, the Pentium G3470 was able to brush aside the Core 2 Quad Q6600, at least when comparing the minimum frame rates. Again the Q6600 was unable to provide playable performance, even with the GTX 1070, due to excessive stuttering. Our Overwatch benchmark is a 'bot test' with two teams maxed out using bots. This is a rather CPU-intensive test that uses all eight threads of the 6700K. 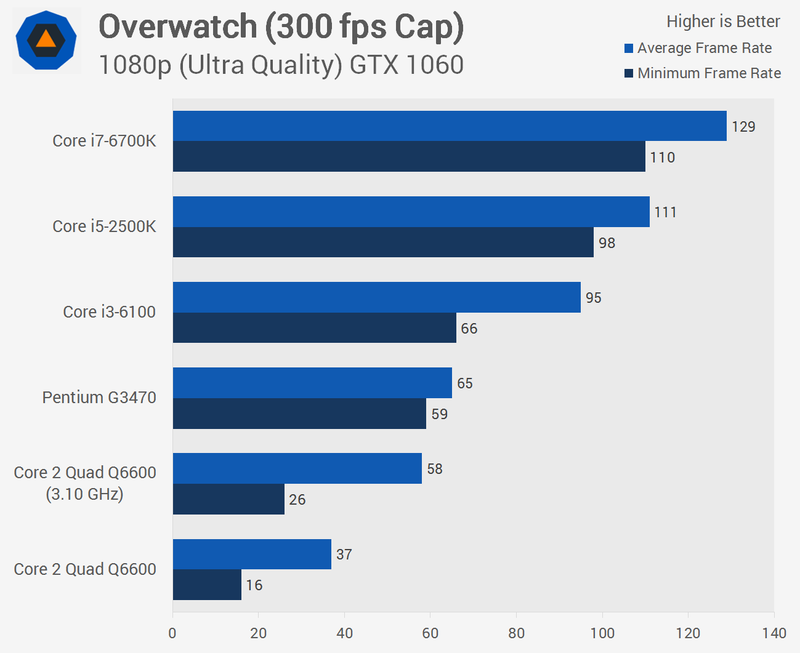 As a result, the Q6600 once again suffers massive frame dips with the GeForce GTX 1060. 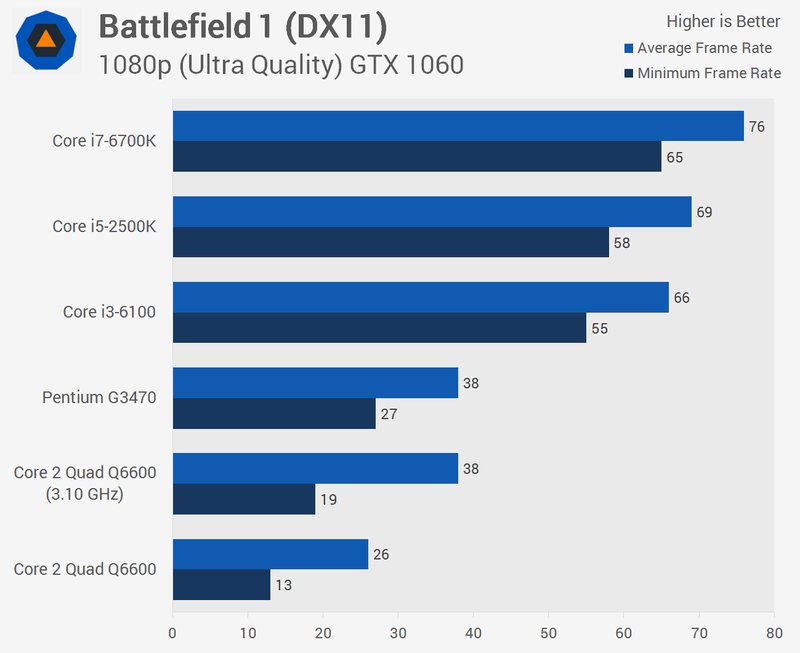 The regularity of the frame stuttering isn't actually as severe as what was seen in Battlefield 1, despite being greater in relation of the average frame rate. Still, using the ultra-quality settings at 1080p the Q6600 wouldn't allow the GTX 1060 to deliver playable performance. 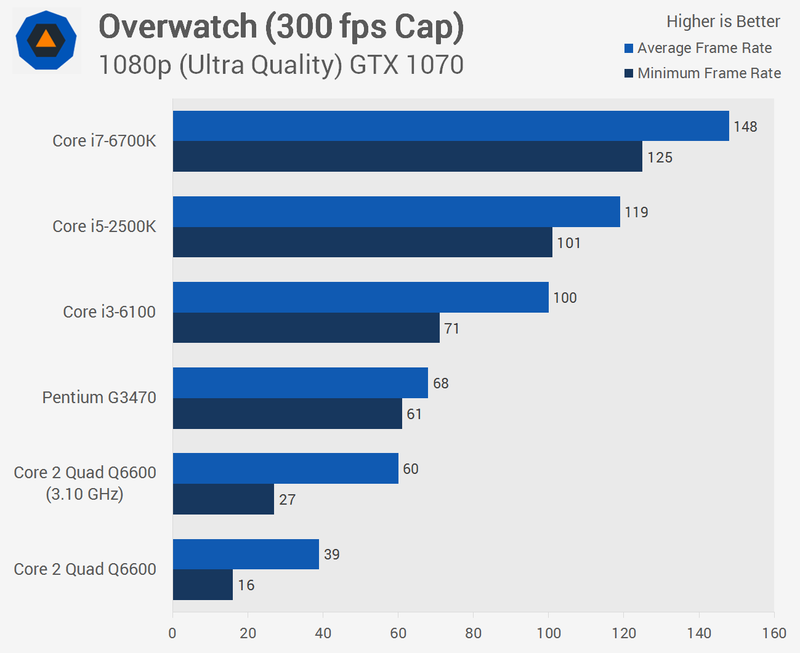 Increasing the rendering power with the GTX 1070 didn't improve performance when using the Core 2 Quad Q6600, the same unplayable performance was experienced. The Pentium G3470 on the other hand was able to deliver 60fps and only occasionally we did notice any kind of stuttering, but it was minor.